Kia has been the dark horse of the automotive world. It started out as a relative unknown for the budget-conscious crowd, but it has quickly grown to become a real contender. Kia offers a variety of attractive vehicles that are loaded with features but still have a budget-friendly price. With the right care, your Kia can last you for many years. That includes getting the proper collision repair right after you’ve had an accident. 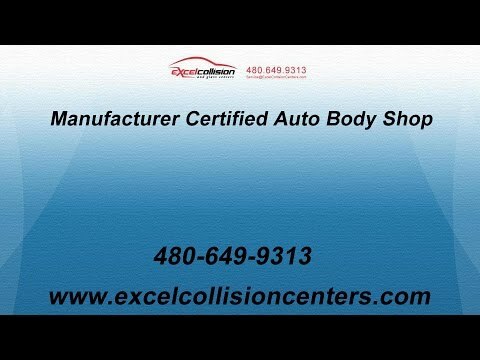 Excel Collision and Glass Centers has a certified Kia auto body shop in Mesa with highly trained and experienced technicians who can restore your Kia to factory conditions. After our collision repair, your Kia may even look better than it did before the accident. Auto body repair from the most experienced and best trained repair technicians in Mesa. A commitment to ongoing training so our technicians always have the latest skills and techniques for performing the best repairs. A lifetime warranty that guarantees the results for as long as you own your car. Exceptional service from every member of our staff in every interaction you have with our shop. You’ll be impressed with the service and the results you get from Excel Collision and Glass Centers. We’ll become your go-to body shop for any future repairs you need for your Kia or your other vehicles. Starting as a bicycle manufacturer company, Kia nowadays is considered one of the most reliable brand of cars in the whole world. There are more than 700 Kia dealers in The United States to give you an idea of how big Kia has turned out to be in our country. With our convenient locations, you can drop your vehicle to any of our Kia Certified repair centers to have a damage inspection. Our mechanics will give you a detailed explanation of what must be done to make your vehicle perfect again. In the case of an accident, the first thing you should do is to contact your insurance company. Excel Collision Centers works with every insurance company available so once they pick up your Kia vehicle, you can bring it to us if you want to restore it back to a pre-accident condition. We work with original manufacturer parts for the body and the engine, so your car will look and feel that it just got out of the factory. Dents, bumps, and scratches can appear on doors, hoods, trunks, roofs, and other places on your Kia car. Because of the complexity that can be to do a dent removal and repair, all the years of experience we have dealing with these vehicles let us do it in a fast, efficient way that won’t mess with the original design of your car. We have the right equipment and the skilled mechanics to fulfill all of our customer’s needs. Many body shops make big promises, but they don’t actually deliver. You may feel betrayed and disappointed by experiences you’ve had with other body shops in the area, and that may make you feel hesitant about where to book your future repairs. At Excel Collision and Glass Centers, we will put your mind at ease. Not only will you feel more assured talking to our knowledgeable and friendly technicians, but you will also feel more at ease thanks to our lifetime warranty. Our warranty guarantees that our work will stand up for the life of your vehicle — or as long as you own it. You don’t have to worry about finding any defects after you drive off the lot or some of the repairs failing a few months or a few years down the road. We deliver on our promises because we are committed to excellence. Excel Collision and Glass Centers take great pride in the quality of our workmanship and are a manufacturer certified by Ford, GM, Honda, Acura, Nissan, Subaru, Infiniti, Hyundai and Kia. We also excel at customer service and satisfaction that brings customers back again and again. "They know how to run a business and understand customers come first. I absolutely recommend this business!" "They do excellent body work and repairs and both times I had an excellent experience."